The Cobra Guzzler HD is thirsty for water! Cobra Guzzler HD Waffle Weave Drying Towel drinks water by the gallons! This amazing drying towel not only is made of high quality 80/20 Korean fiber, it has the benefit of 5 mil absorbent sponge in the middle. Simply put the Cobra Guzzler HD Waffle Weave Drying Towel drinks more water per weight then any other waffle weave towel on the market. It guzzles it. Waffle Weave microfiber towels are used by many enthusiasts and professionals. The nap and softness of microfiber allows it to safely remove water with out scratching. The waffle pattern allows it to hold a large amount of water. Cobra started with their famous Guzzler microfiber and sewed two of them together to create a plush towel. In between the two towels they inserted a foam absorbent sponge. 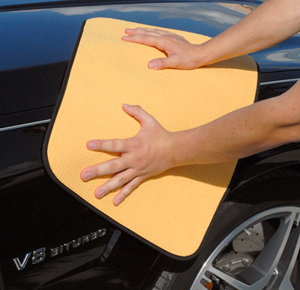 The result is the only drying towel you will need to dry moderate sized vehicles. Soak up the water with the Cobra Guzzler HD!